The day Barbara knew the time was coming was the day she set the electric kettle on fire. She had intended to boil water for her breakfast tea as usual. She filled the kettle, then set it on the front ring of the electric range and turned the dial to High. Barbara improvised a story about a pot of soup boiling over. “You have to stay in the kitchen and keep watch when you’re cooking,” Bob told her. As if she didn’t know that! He stalked over to the stove and scrutinized it, but the scrubbed and polished enamel loyally confessed nothing. “Would you like a cup of tea?” Barbara asked. She was prepared. She’d rushed out and bought a new kettle after disposing of the remains of the old..
“No thanks. Estelle and I are going out for bridge this evening. We have to eat early.” Bob seldom stayed for tea. Today he didn’t even take off his coat. “Everything all right? Need anything?” His usual two questions. “Take care then. Bye.” He was gone. She locked the door behind him. It was good of him to call by every day. She was fortunate to have a caring and conscientious son keeping an eye on her. There were many she knew from the senior center who had no one. They called each other for a daily check-in. She didn’t need that service. She might tell the story of the kettle there. She’d make it into one of their senior moments jokes. They would laugh. Bob would not find the story funny. He would raise a rumpus if he knew. He would worry. He would lecture her on the advantages of seniors’ residences. She knew, she knew. She wasn’t hiding her head in the sand here. She’d have to go, sooner or later, and the sooner was becoming more and more sooner, as the kettle incident had just proved.. She was not entirely opposed to the idea. In fact, she wouldn’t mind giving up cleaning and cooking for herself. She could apply the energy those tasks required to more interesting activities. She could do some serious reading, or learn to play bridge, or take up watercolor painting. “I can tell you who they are. I could label them for you,” Barbara offered. “But if we never knew them as people, why would we want to know their names or look at their pictures?” Estelle asked. Why indeed! She’d never known half of them herself, except by name. But dumping Great Aunt Marian and Gran’s Cousin Annette into the garbage like a melted teakettle would dishonor the family. She simply couldn’t do it. Then there were books: books she’d always planned to re-read, even if she hadn’t looked at them for ages. And Oriental carpets collected through the years, and the Mexican glassware she and Laughlin had bought on their honeymoon, and a few rather nice paintings that Bob said were too ‘arty’, and Grandad Ethrington’s curios from his time in the army in India. Sometimes she made a list in her head of the things she absolutely must keep, things she would take to the residence with her. The list got longer and longer. She’d read somewhere that in olden times in China – or perhaps it was in India, it didn’t matter – a devout Buddhist, upon reaching the age of fifty, would walk away from her home with only a begging bowl and the clothes on her back, freeing herself from all material concerns and at the same time ridding the family of the care of her aging self. Until recently, it sounded like a good idea. Now she realized the sadness of it. The next incident along the trail to the retirement home was the disappearance of a sum of money. This could not be hidden from Bob because, after Laughlin’s death, he had taken over the management of money. Barbara appreciated his help in this matter. He filed her tax returns and monitored her accounts and credit card statements. He was good at it, so, not surprisingly, he spotted the $1,400 debit straight off. She did it online, she confessed. She’d clicked once and pouf! the money was gone from her Visa to someone else’s and she couldn’t figure out how to fetch it back. “You already have!” Bob left in a huff. “Don’t touch any site whatsoever that involves credit cards,” was his parting shot. The last straw came when Barbara fell on an icy sidewalk. Some officious person witnessed the misstep and called an ambulance, the fool, and at the hospital they fussed and insisted on two stiches and a CT scan. She didn’t like any of them. “The people there are so old!” she complained to Bob. Bob looked bored. Perhaps she’d told him that story before. “The point is, anyone can make a mistake.” She still hadn’t told him about the melted kettle. As far as he knew, all she’d done was to take a bit of a fall and lose track of a few hundred dollars. And pass her eightieth birthday. And for that she was sentenced to life in a seniors’ home? So soon? She chose The Gardens, mostly because of the name. Those places were all the same, really. Still, she was fortunate to have a choice. Many seniors had no such privilege. She began the sad process of sorting, packing, disposing. It was practice for dying. “Naked came I out of my mother’s womb, and naked shall I return thither,” she muttered as she worked. She took Aunt Marian and Cousin Annette out of their frames, sent the frames, along with Grandma’s tea service, to the Attic Treasures sale at the church, but saved the photos themselves. It was the best she could do for them. Then she started in on the knick-knacks and keepsakes: the Royal Doulton figurines and the kilims, the chess set Laughlin had loved and his collection of pipes; his tail coat and her two ballgowns; Grandad Etherington’s stuff. Barbara picked up his brass bowl from India. She liked the feel of the cool, rounded metal in her hand. She loved the heft of the piece and the intricacy of the hammered pattern. She added it to the ‘save’ pile. It would make an ideal begging bowl. 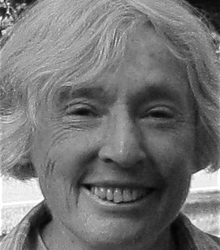 Katharine O’Flynn is a retired teacher of English. Her published stories include the chapbook collection Photographs (Red Bird Chapbooks) and, most recently, Coming Home (Seraphim Editions). She lives in Montreal, Canada. View More: Next piece "Suspect", Home, Archive. What a lovely story. Well told. The final sentence really hits you right in the gut. Powerful. Thanks.